Software has an option to add multiple databases for managing the case sufficiently. This option makes forensics convenient by adding multiple custodians in a single case using the custodian settings. In order to manage the large-sized Sqlite database, software performs indexing of databases. Indexing the large sized database will help users for efficient Sqlite evidence analysis and further investigation. 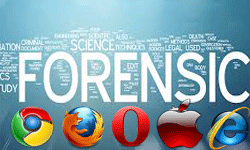 Software offers recovery of deleted items as well which helps in detailed analysis of the databases. Users can also view these deleted or secured deleted data items efficiently from the Sqlite database. 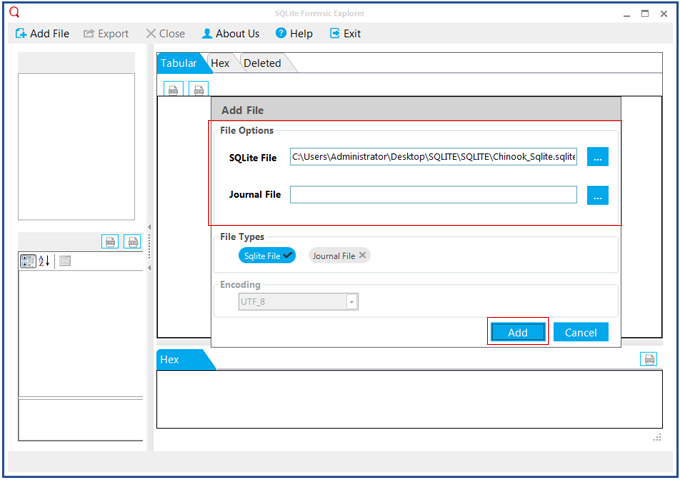 Sqlite engine uses a journal file in order to store original data of user as a backup. 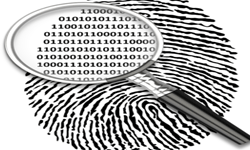 This software is capable to recover journal file well which helps for the investigation of cases and evidence analysis. Tool is embedded with a facility to differentiate different data types using color scheme. This distinguishes the secured deleted data, normal data and deleted data from the Sqlite databases. BLOB also known as Binary large objects can be previewed using this software. Software lets users to view tables, byte code, structure, etc. along with components like images, videos within BLOB data. 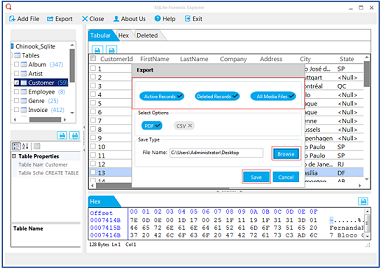 Tool also helps to analyze the emails available in the binary form using the Hex view. This Hex view enables to view data in binary format for any manipulation done helping in further examination. Users can collect the crucial artifacts from the Sqlite databases and then allows exporting them to CSV, HTML, and PDF files. Once exported, the artifacts can be saved in same format for report submission. 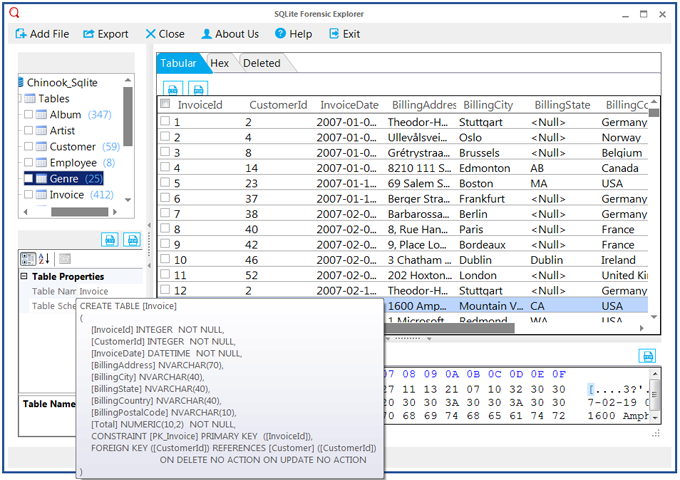 SQL Editor Option of the software allows users to add multiple queries to perform search on Sqlite database. This option makes forensics convenient by adding and saving multiple queries in a single case. Sqlite Forensics Toolkit is an excellent option to read universal data from a Sqlite database that specially designed to investigate from deleted, corrupted data. 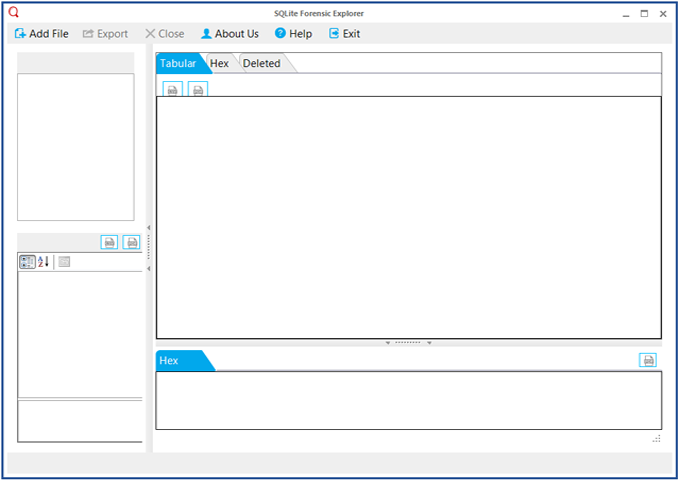 The toolkit is one of the best application to preview every structure/commands/bytecode program of Sqlite for forensics purpose as Tokenizer, Parser, Code Generator, Virtual Machine, B+ Tree, Pager, OS Interface etc. It offers a unique structure view and provide valuable investigation in many cases. 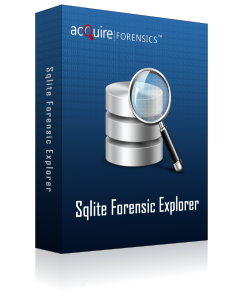 Every technical person knows that the Sqlite forensics investigation is very important to catching criminals because in most of cases, criminals use Sqlite indirectly but they don't know about it that in present time most of application developers are using Sqlite as Whatsapp, WeChat, Facebook, Skype, Emails etc. Forensics investigators can easily get evidence from currently available files and deleted files also by using this application. Which file format of Sqlite does the software support? Sqlite Forensics Explorer supports every file format like *.db, *db3, *sqlite, *sqlite3 etc. Does the tool recover deleted and corrupted files? Yes! The forensics investigators can easily get deleted and corrupted data. Does the software impose any limit on the size of the Sqlite database file? No, there is no size limitation on the size of the Sqlite database file under examination. How many files can be added in the software for examination? The software supports examining multiple Sqlite database files at a particular instant. Does it support all Windows Operating Systems? Sure! You can install this tool with every version of Windows OS. Is the software supported on Mac operating system? Since, it is a Windows based tool, it will not be supported in Mac operating system. Does the software capable to preview all components? Yes, it is fully able to preview all items as columns, triggers, rows, tables etc. The tool is an excellent way of analyzing and reporting Sqlite data files to get correct identification. After completing identification process, it previews all files successfully. I'am really thankful to developing this amazing forensics software. I get full satisfaction by using this application, because it is wonderful to catch evidence from deleted Sqlite data for investing purposes, it is greater to analyze cleared browsing histories and erased text messages from Skype, Whatsapp etc. © 2018 www.sqliteviewer.org | All Rights are Reserved.